I bought a job lot of stuff and with it came two what look to be transport boxes for rockets / missiles? I think we got a better deal by taking them as he needed the space. Just trying to find out more info? They have desiccant sensors on the side and air pressure release valves, one looks to have the remains of a Lossiemouth sticker? They are fibreglass very well made, my Son is making one in to a Coffee table! Thanks Clive any idea what it was used for? No idea I'm afraid, but the background to the company it looks as if it is something that travels through the air. Could we see inside the box, are there any cut-outs to show the shape of what it once contained? It is very difficult to read the dimensions on the label, what is the size of the box? It's difficult to judge, is that fitted on a roof rack? I will get them out later can't lift them on my own! Lhotellier Montrichard manufactures and markets aeronautic and space composite parts as well as plastic containers. Its main clients are arms and aeronautics industries, transport and logistics, and packaging industry. The company is based in Montrichard, France and is a subsidiary of Daher. As of May 1999, Lhotellier Montrichard operates as a subsidiary of Daher SA. Take some photos of the internals, a mate of mine used to work in Lossie dump so will probably recognise them. 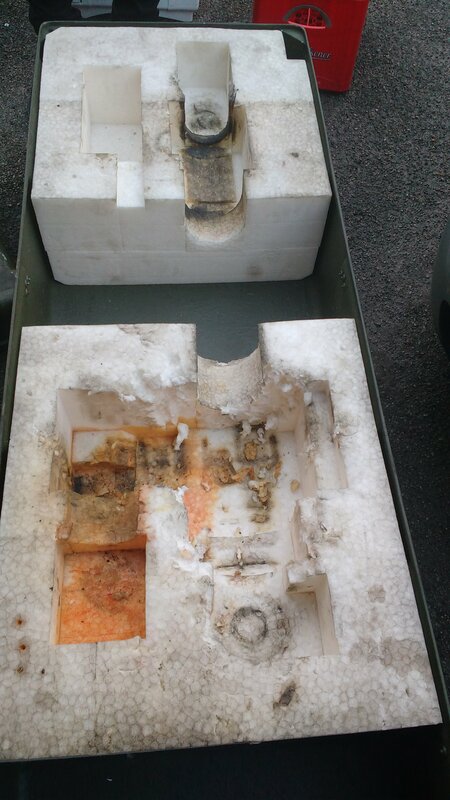 Finally got one out, insides look like polystyrene but much heavier duty? It’s the box for a hydraulic actuator, the black end is from the fescalised portion with an eye at the end. The near end has the opposing eye and hydraulic connections with control box. The red staining is OM15 hydraulic oil. Likely Tornado, so could be Wing sweep, taileron, nose gear, main gear or flap. Looks to big big for rudder, or under carriage doors. 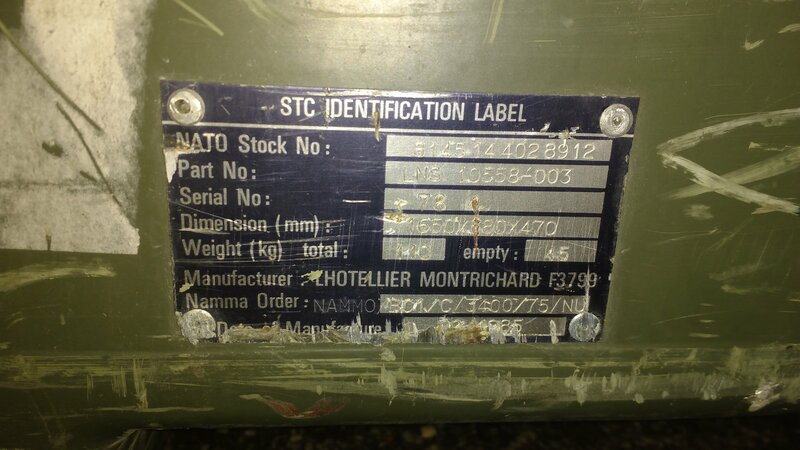 Thinking about it some more, with the box’s French connection and going back a little further with the Lossie connection, it may be a Sepecat Jaguar item. Landing gear was quite substantial on the Jag as it was designed to take off from rough runways.